Welcome to Bunkai TV Our main site is www.bunkai.co.uk. That's where you can find our range of Karate Kata Bunkai DVDs, Books, and Downloads. On this page we share the video clips about practical applications to moves from Karate kata. They are a taster of what is on the DVDs. Over the years we have featured our core concepts for Kata bunkai, examples of various moves, and answered viewers' questions. Karate-do is The Way of the Empty Hand. Kata are the formal exercises practiced in that tradition. Bunkai means analysis, and most people take it to mean application. Truthfully, Oyo is a better term, meaning use or apply. Our Oyo features realistic responses to the common types of physical attack. They are used close-in, and they happen to look just like the moves from traditional Karate kata. These are part of what we are discussing in the Bunkai Strategies Newsletter. This is a free subscription for our readers and viewers. 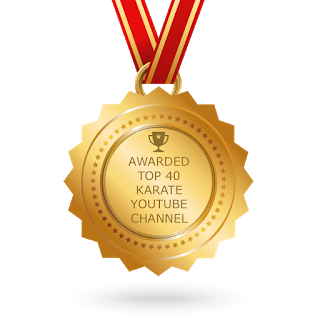 Bunkai Strategies has been running for a few years now, with more than 300 videos to view. Our archive of video clips for last year can be found here. Also 2017, 2016 is available, and here for 2015, here for 2014, here for 2013 and here for even older. Of course, these are only snapshots compared to what is available on our DVDs, Downloads, and in our Books. The most recent DVDs from John Burke (me) can be found here. 2019 This year's videos for 2019 are to be found here: Each week we have the free clip here, and the expanded and enhanced version is emailed to Bunkai Gold subscribers as a download for them to keep. Immediately prior to the first kiai in Hangetsu kata the arms rise and fall. Are they really open handed blocks? The videos on this page are copyright John Burke © 2014, 2015,2016, 2017, 2018 & 2019. They are produced for the sake of education about the possibilities contained within Karate Kata with relation to self defence. They must not be construed as advice as to what is legally or morally acceptable in any particular part of the world. As always, martial arts training should be undertaken with the guidance and oversight of a qualified instructor. Demonstrations shown here are not shown at full speed and power, and the distances have been exaggerated to allow the viewer to understand what is happening.